The entry fees are now due. The payment details are the same as last year. If you do not have them please PM me. Entry fees received from Brumos, David Mitcham and Big Mick. I'll update the list later in the week. Edited by charlesx, 23 February 2019 - 02:56 PM. Hi again Stubbo/Alan. 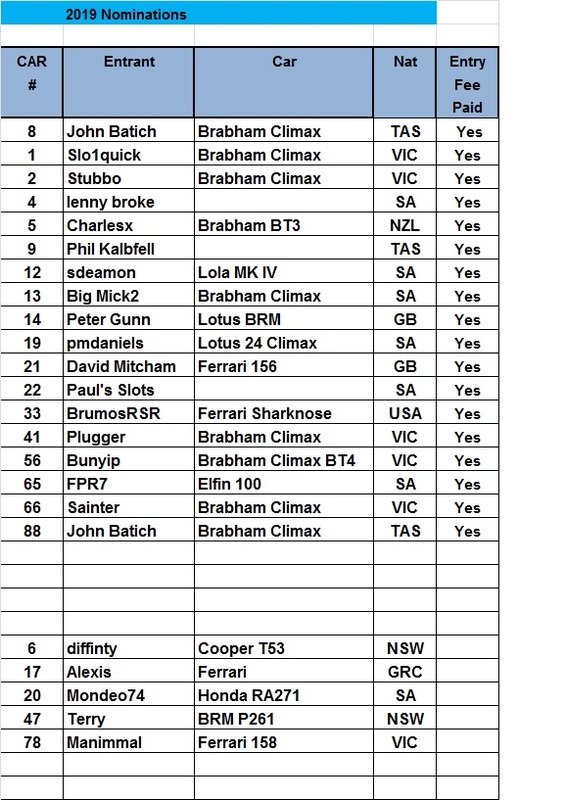 Entry paid for charlesx - No.5 Brabham BT3 via Paypal today. No problems either way . Let me know what you decide to do. I'm ashamed to say that I will have to withdraw from this fine series. The Ferrari 156 is on its way! Current entry list. If you have paid and I haven't marked you off please let me know when you paid so I can check it out. Can you also please fill in any blanks. Test post using Imagur. Seemed to be fairly easy to use. Edited by Stubbo, 12 March 2019 - 12:16 PM. Hi Stubbo. My car was posted 6/3 so should be well on the way by now. Car identical to 2 years ago except new PG XPG tyres. 16 spec motor. Plate type chassis. Try and get a pic to you guys on the other post. The arrivals have started. Peter Gunn and Chas are in the house. Manimmal is in the house!